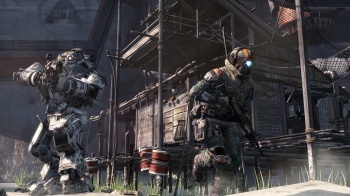 Titanfall Developer: "Framerate Is King"
Titanfall is focusing on fun gameplay and solid performance, and according to the developers, any flashy effects that would jeopardize those values aren't worth the risk. Titanfall is quickly shaping up to be the next-gen shooter to watch out for. Made by some of the creators of Call of Duty, its blend of highly mobile jetpacks and heavily armed mechs creates a compelling battlefield - even though the game itself is built on somewhat old-school technology. Respawn Entertainment's Drew McCoy recently explained how Titanfall makes the most of the nine year old Source Engine, and why he prioritizes performance over cutting-edge effects. The Source Engine may be the foundation that Titanfall is built upon, but Respawn's engineers have made some liberal changes to the way it works. According to McCoy the overhaul was essential to make the engine fit with a game like Titanfall, which is incredibly different from Valve's titles, computationally speaking. "It's actually a pretty slow engine for showing stuff on screen," he explains. "What we have in a level now would run in single digits on what it was before - if you could even get it to load at all. It's been a huge engineering task." The advantage, of course, is that Source comes with nearly a decade of refined tools and polish. Don't let the single digits comment scare you, though - Respawn is investing the power of next-gen processing in relatively traditional graphical effects. The performance boost should be clear: no promises of 60 frames-per-second have been made just yet, but McCoy seems hopeful. "We'll see how performance goes," he says. "Framerate is king."